We were travelling on a hopscotch ticket in the Outer Hebrides when we downloaded Ifor’s A1. Our first reaction was consternation as Ifor, in the EV and IQ series tends to challenge our solving ability. What’s more, we were house guests and I am sure you know how embarrassing it can be to lose the thread of Friday evening’s conversation as you surreptitiously glance sideways and attempt to fit a seven-letter plant to “Air’s on fire, whirling round evacuated butane plant”. (Yes, it gave us ASTILBE with the extra IR of the clue going into a Scottish name – ALASTAIR – one of a number that seemed to be appearing as we solved). 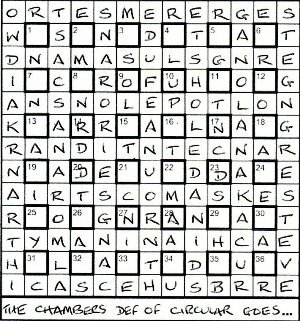 Only one numpty was able to really devote full attention to the solve but, happily, it proved to be a generous compilation with some fine gifts of clues “Free to gain cue from within oneself” (AUTOGENIC) – but what compiler could resist such an obvious anagram? “Box of Lego sorted out” (that one too! A friend has moaned to me that it was rather obvious but it would be difficult to find a finer clue for LOGE and the numpties, reared on “Stripey horse (5)” have no problem with a few obvious clues). I was looking for the usual Listener compiler touch of the strong stuff but found only a few wine bottles in the clues, together with some breakfast cereal and an Ecstasy drug bust, but what did emerge was a glaring predominance of railway references – the LNER, a ‘non-stopping train’, ‘Edinburgh and London – capitals connected by line’, ‘Train heads to an over-the-border destination’, ‘Express train left after a series of years’. We were beginning to suspect that we were on familiar ground. I remember waiting for hours with my train-spotting mad cousin Mac on the platform at Hellifield station because the 4472 was exceptionally expected to come through there at some time in the day. Oh, the joys of those little books of train numbers that we crossed off when a previously un-spotted engine puffed its way through the station. And, of course, there it was. Clues 24d, 44ac, 7d and 2d seemed to be the ones with no definitions and produced the company LNER and the culprit, the FLYING SCOTSMAN. Those Scottish names now made sense – they must have been his Annie and Clarabells (or were they just Scotsmen?) and, of course, it wasn’t difficult to find L on DON (LONDON) and ED in BURGH (EDINBURGH), though the rail line between took us a little longer, even if it did snake rather appropriately up the east side of a putative east coast. That’s another ‘old hands’ trick’ if, after nearly four years of Listener solving, we can call ourselves that. If you don’t find the hidden message on the diagonal or running in a circle round the centre, see if it is laboriously hauling carriages from the bottom of the grid upwards – the unlikely direction that is invariably more difficult for solvers to find. I was surprised to find that this was only Ifor’s second Listener, as I’ve done a number of his puzzles before. It turns out that most of them had been in the EV series. I had good memories of them, as well as of his first Listener Frightened Catherine with its Fahrenheit/Centigrade theme. In A1 we would end up highlighting the connection (14 cells) between a start and a finish (11 cells). The A1 road in Britain connects London with Edinburgh, and they were both in the clue to 7dn Edinburgh and London — capitals connected by line. I didn’t twig what line was being talked about … unlike some solvers no doubt. Across clues contributing to what needed highlighting had to lose some letters before solving, and I suspected there would be quite a few of these. There were also four wordplay-only clues which would have to be dealt with thematically. I decided to start on the down clues first since they were pretty much normal. My first pass through gathered about a dozen entries. I was reaonably happy with this, so started on the downs. 1 was Ran over to take a chance reforming aged family of parasites. Not being an expert on biological parasites, I resorted to Mrs B, and the only realistic entry she had beginning with O (I already had OPIATES) was ‘Orobanche’, and Chambers provided OROBANCHACEAE. This took a bit of disentangling, and proved to have the ‘ran’ as extraneous letters with the rest deriving from O + ROB + CHANCE* + AE. Ranald Alastair Callum Cameron Arran Finlay Murdo and Logan. So here we had another Scottish connection. With a complete grid, ED in BURGH was at the top of column 4, and L on DON was at the bottom of the last three columns. What linked them, however, wasn’t obvious at that stage. Despite having told myself that the A1 connected London and Edinburgh, it took a good fifteen minutes before it occurred to me to look for the connection going northwards up the grid, but there it was … The FLYING SCOTSMAN. Those eight Scots had indeed flown from the across clues. 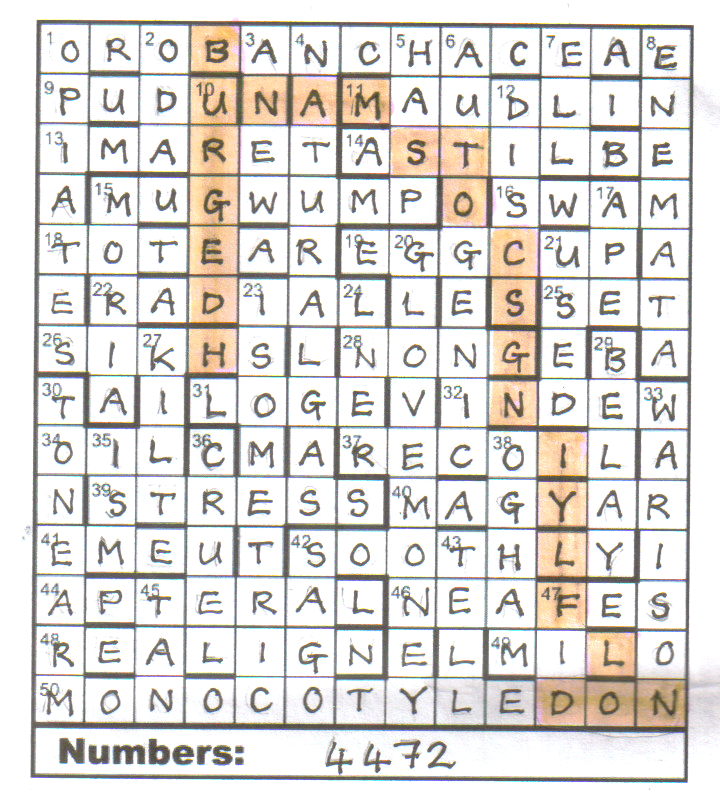 There were four wordplay-only clues, 44ac APTERAL, 2dn ODA, 7dn ELL and 24dn LNER. LNER was obviously the word that provided leads (ie initial letters) to a thematic ‘group’ … one of the late, great railway operating companies. That meant that I was left with APTERAL, ODA and ELL. I looked at them for a short while, trying to determine in what order their clue numbers should be entered below the grid. Of course, it turned out that the words themselves had nothing to do with determining the order. It was solely the clue numbers that we were interested in. I got there by working out what numbers I would put beneath the grid if I were setting the puzzle. For a very brief time in my teens, I had done a bit of train-spotting. Unfortunately, I don’t think that The Flying Scotsman, LNER loco number 4472, was one of the ones I collected. Shame. Entering 4472 beneath the grid completed a very enjoyable puzzle from Ifor, so thanks for that. I wondered how long we would have to wait before we were served another railway-oriented theme!! Next useful prompt: our author to be has two names and one is apparently 15 letters long and the other 13. Store it away for later! Now let’s look at the clues and find that we have jumbled misprints with a playfair … NO! Immense relief, none of those odious extra letters; just plain straightforward clues with merely a murmur about a few jumbles to come, probably in the endgame. So we solve – at break neck speed almost – at least, one numpty did. I could barely keep pace writing his answers as he shot them out and the grid filled in under two hours. This really was a gentle solve after the fearsome maths with misprints and demanding knights’ moves! Perhaps we were lucky as TRANSCRIPTASE ‘Sat near one eccentric taking exam paper in type of enzyme (13)’ had to finish with ASE and was an obvious ‘eccentric’ anagram (SAT NEAR* round SCRIPT), as was ‘Playhouse: that’s where many are assembled to take in a bit of drama (15, two words) (THATS WHERE MANY round D*) leading to WYNDHAM’S THEATRE. Anyway, the editors will not have any problem wiping out any remaining ‘all corrects’ this week as the perfect trap is lying in wait for all. We’re wise old dogs now so we know that when we encounter EL NIÑO intersecting with WHITENER, we mustn’t just assume that we can transliterate that character into an upper case English N. After all, the ñ and n are quite distinct in the Spanish dictionary and must be treated differently. So we’ll enter in lower case OK? Ah, but then we have whiteñer – either way we are scuppered – but so is everybody else! Maybe, to satisfy editorial exigencies, we should squeeze both characters into one small square and survive. Ha! We continue anyway, noticing that Gos shares the Listener setter propensity for a drop of the strong stuff (but only a drop, ‘Small amount of wine removed from cup’ and ‘With time her wine gets drunk in addition to coffee’) and we have enough letters to feed into a word finder that produces JOHN DICKSON CARR. We live overseas and can’t nip into the local library to check on obscure characters but, of course, the Internet tells us he wrote as CARTER DICKSON too, and a quick scroll down the list of his works shows us that he has a few with two names including ‘NINE – AND DEATH MAKES TEN’ – there’s our suspect, neatly circling the centre of the grid. 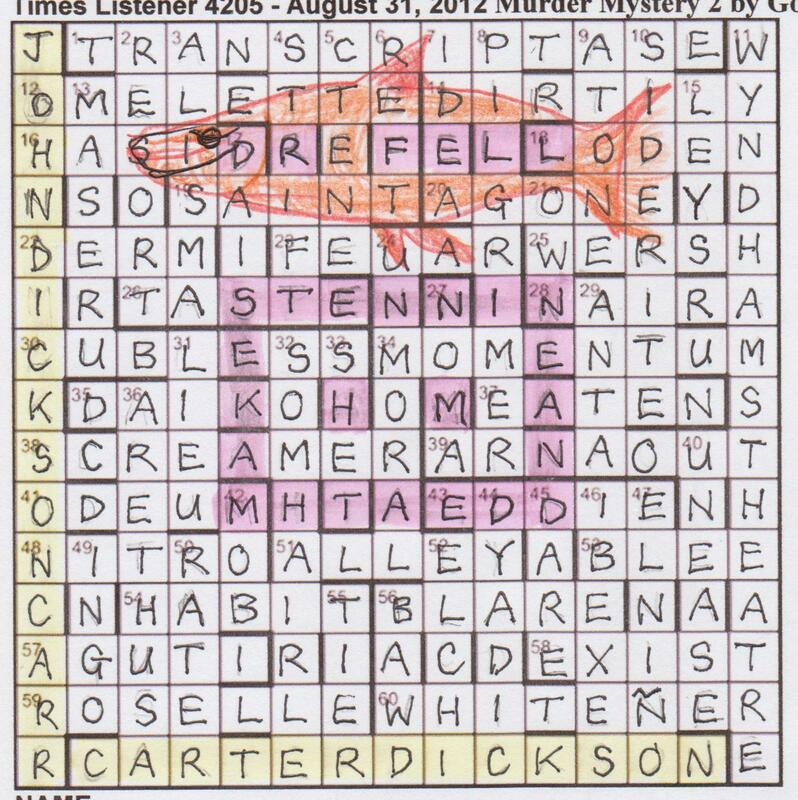 We’ve learnt along the way that DR FELL is one of Carter Dickson’s two tecs and surprisingly he is there in the grid, tempting the unwary but we are learning to smell a red herring when we come across one as he doesn’t fulfil the requirement for ‘the usual nickname for the detective at the centre of the investigation’. That’s HM (Sir Henry Merrivale) isn’t it? And sure enough, there he is in the centre of the rectangle. We’re reminded of Dysart’s Prize and Prize Winner where we hunted vainly for Kafka before finding Haruki Murakami. Oh these wily setters! 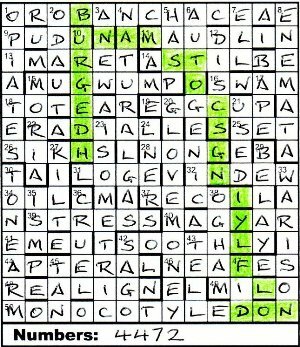 I would say that that red herring was the highlight of this crossword – and, for us, the pleasure of completing it before it was time to cook and eat Friday dinner. So this was Gos’s second murder mystery. The first one was back in February 2005, and featured the American sleuth Ellery Queen. I wondered who we were up against this time. Nothing special about the clues, but a few entries would need jumbling where they coincided with the detective. I wasn’t too unhappy with my first pass through the acrosses. The cleverly disguised hidden at 12ac Tiresome letter’s written in what could be Spanish would have been a good start, but HASID proving his identity at 16ac took that honour. That was followed by SAINT Stephen at 19ac, DERM at 22 and WERSH at 25. African bread (ie money) was NAIRA at 28 and with ODEUM hidden in 41 and good old EDDIE Fisher at 43, that was all I could muster for the across entries. And that assumed that they didn’t have to be jumbled. 3dn saw a third hidden in SenegAL IS MArsh-mallow, and I thought we were being treated rather well. In due course, a reversed hidden was to come in secRET ARmy at 50dn as well. Meanwhile, 7 IDEA was slotted in, but the anagram of ‘thats where many’ + d had to wait a bit longer before WYNDHAMS THEATRE could be entered at 11. A few more downs, and I was well on the road. However, I was getting distressed by there being very few clashes in the grid, which would indicate an entry that needed to be jumbled. As it turned out, there were only two: MOAN at 27dn and HEST at 33dn, neither of which had many options to give new words, and were NOMA and SHET. The grid wasn’t filled in double-quick time, but I suppose a reasonably quick couple of hours, with JOHN DICKSON CARR and his pen name CARTER DICKSON being the two unclued entries. Apparently (because I don’t think I’ve heard of him before), he was one of the best exponents of the locked room mysteries. A quick perusal of Wikipedia revealed that what was considered to be the best ever locked-room mystery was The Hollow Man with Doctor Fell as the sleuth. There in row 3 of the grid was DR•FELL, but The Hollow Room was nowhere to be found! Luckily for me, after about twenty minutes of scanning the grid, I noticed HTAED in row 10, and Nine — and Death Makes Ten was soon identified as the US title of one of the Sir Henry Merrivale mysteries. He was often referred to as HM, and he was to be found at the centre of the ‘locked room’ formed by the highlighted title. So, thanks to Gos for an entertaining puzzle, with a false trail from Dr Fell. After the Kafka/Murakami deception from Dysart a few weeks back, this may be the last for some time … or the second, with many more to come! As a quick postscript, there were three Whodunnit puzzles by Mime back in the 80s and 90s. The last of these featured John Dickson Carr and Dr Fell.